I planned to devote this blog entry—my first in two weeks—to the Virginia Blackboard User’s Group Conference, which I attended on Friday. But what lingers in my mind today isn’t the conference, it’s the personal narratives that my students presented in class after their draft workshop on Thursday. To shift students’ focus away from “correcting” their classmates’ writing, I decided to devote the second half of class to Readers’ Theater. After students read and commented on their group members’ drafts, each group chose an essay to perform for the class, assigned parts, and assembled impromptu costumes and props. impression on me. As readers they offered descriptive rather prescriptive comments, and as performers they gave their stories a life in the classroom that was separate and distinct from the words on the page. 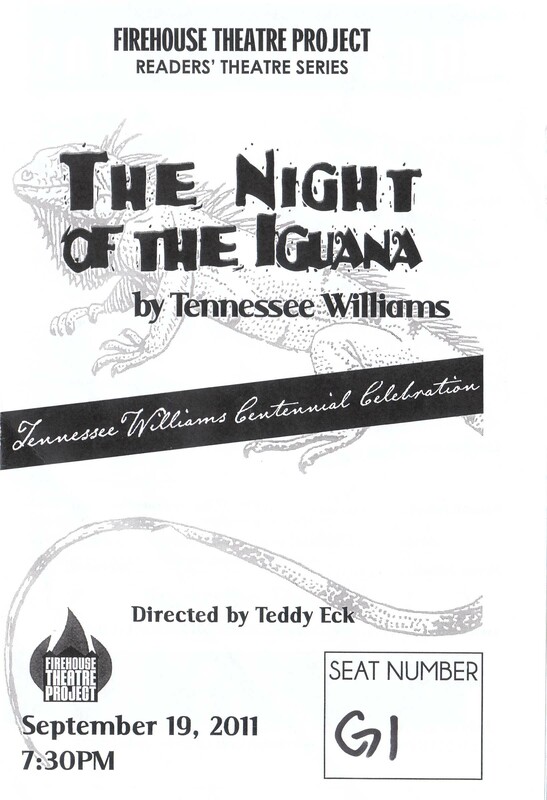 The idea of combining a draft workshop with Readers’ Theater stems from my renewed interest in drama and my recent experiences at Readers’ Theater performances staged at the Firehouse, including the September 19 reading of The Night of the Iguana, part of Richmond’s Centennial Celebration of Tennessee Williams. The power of live theater and its influence on my teaching also speaks to my experience at yesterday’s Blackboard conference. Though I use Blackboard on a daily basis—and it’s usually projected on the screen in the classroom at least once during each of my Tuesday-Thursday classes—for me it’s simply a tool: a content management system for content that’s always changing. During yesterday’s conference sessions, many in the audience divided their attention between the large screens at the front of the room and the small screens in their hands and their laps. In the 1:15 session, I overheard a man say his iPad was attached to his thigh. More and more I see the need for opportunities to turn away from the screen and to face each other. Though I don’t agree with many of David Mamet’s sentiments—in particular some of his pronouncements in his latest book, The Secret Knowledge: On the Dismantling of American Culture (2011)—I do concur with his notion that people go to the theater to see that real communication between human beings is still possible. I know for me it’s true. My own return to the theater is in part a response to our increasingly digital lives.